Artistes simply known as Decyple, is a Ghanaian singer, songwriter of the famous Trigna Global Record Label. He gained prominence after the release of his baddest tune titled ‘Club Devil’, is a very emotional tune and very meaningful. Brainybeatz recorded on the Version of his ‘ Attitude Riddim’ which has become the street anthem in Ghana. Acts like Stonebwoy, Yaa Pono, Samini, Jupiter, Jah Lead, RoWan, StarGyal Denorah and Many Others jumped on his version of the ‘Attitude Riddim’. Decyple steps into 2018 in style as he dishes out his version of Brainy Beatz “Attitude Riddim” titled “I Love You”. Whiles working on the tune, Brainy Beatz endorsed Decyple’s Version of his ‘Attitude Riddim’ as one of the best to hit Ghana and Disporia. However, he goes deep on this one as he is heard throwing some shots. Amazing song from Decyple by all standards. Decyple drops his version of Brainy Beatz Attitude Riddim. He titles this tune, “I Love You” which will get you motivated and inspired. Stream, Download and add to your playlist. 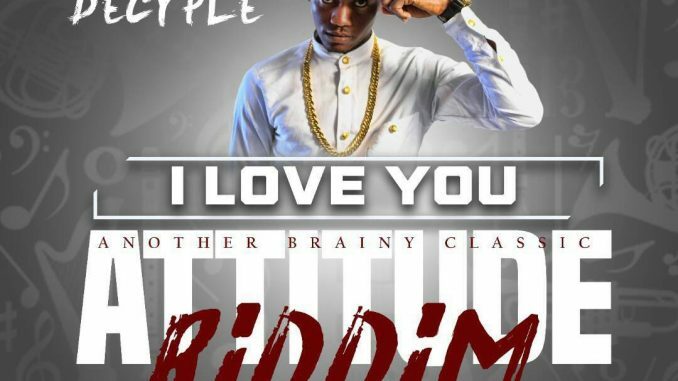 Enjoy Decyple – I Love You Lyrics , How Can You Judge A Book By It’s Cover, Gyal I expect Yuh to Know Better.